LeBron James Returning to Team USA in 2020 Because of Gregg Popvich? LeBron James Returning to Team USA in 2020 Because of Gregg Popovich? Cleveland Cavaliers superstar LeBron James and San Antonio Spurs head coach Gregg Popovich have had a number of big game encounters over their careers and have growing respect for one another. LeBron James battled Popovich’s Spurs during the 2007 NBA Finals with Cleveland losing 4-0. Then, in 2013 and 2014, the two met again with James as a member of the Miami Heat. 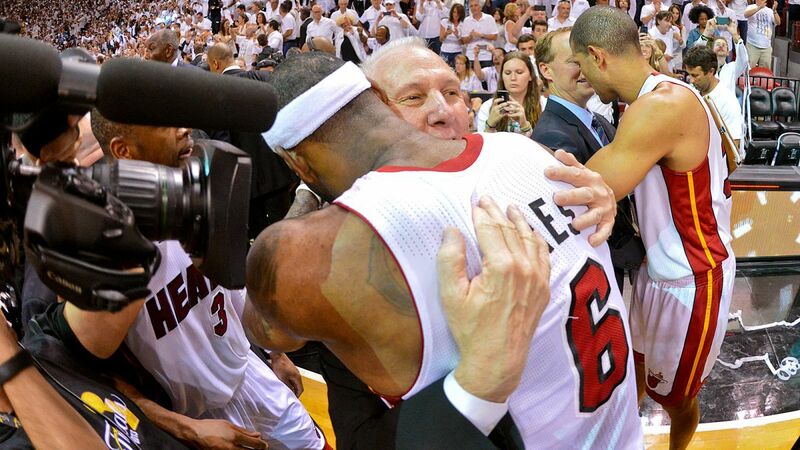 In 2013, Miami took out San Antonio, 4-3, having James won his second of three championships. The next year, San Antonio came back with a vengeance overcoming Miami in the Finals, 4-1. With Popovich taking over Duke’s Mike Krzyzewski’s position as head coach of the United States Men’s National Team in 2020, LeBron James might come out of Team USA retirement. James, who always wanted to be a member of a Gregg Popovich-lead squad, could get his opportunity in 2020. LeBron James skipped the 2016 Rio Olympics because of his championship run with the Cleveland Cavaliers that drained him. If he did compete, he would have played basketball almost all-year long. Popovich spoke on he and James’ rivalry and the respect they have earned between each other. If LeBron James were to return to Team USA for Tokyo 2020, he’d be 36 years old and possibly the oldest player on the squad.